Bibi, can you share your background before you began your practice? 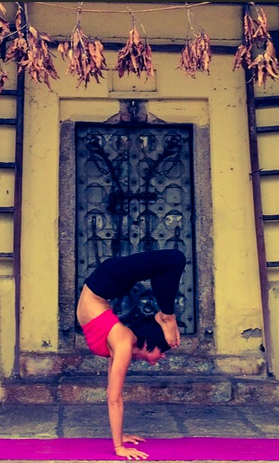 Before I began practicing Ashtanga Yoga, I spent 5 years wandering around different yoga studios. I had initially encountered yoga by chance. I was living in the East Village when I first moved to NYC at 21 years old. I was waitressing to pay bills while studying theater with John Strasberg and I was too broke to afford a gym. However, I did not have a great relationship with my body during this time and craved exercise in an unhealthy obsessive way. One day I stumbled upon the studio, Yoga to The People. That was it. I started to spend most of my free time taking donation based yoga classes. I noticed that the only time I could appreciate my body, and establish a loving relationship with it, was during and after yoga practice. So, I started obsessively taking 2-4 yoga classes a day. I would attend a class in the morning to get over my bad night out, at noon to skip lunch, and after class to get energized and ready for the night out. Although I was utilizing yoga classes in an incorrect manner, it was impacting me at a deeper level. Although, it was still ego-based, but I was devoted to it, albeit for the wrong causes. During this period, I began investing time and reading yoga books. 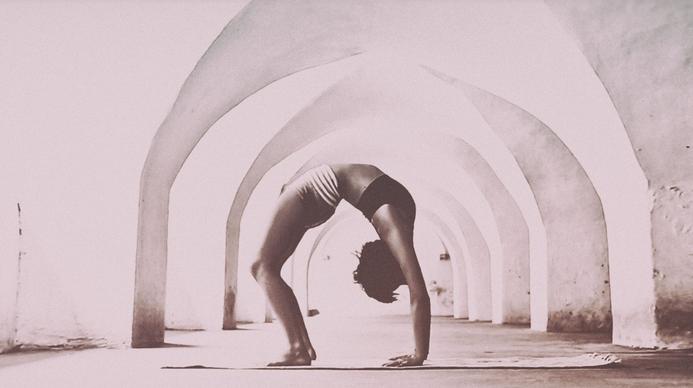 The more I read about yoga, and the more I moved my body, the more I realized how little I knew about myself beyond the physical - which I very much disliked- and how I could not relate to my own body. For example, I started to wonder and doubt how and if I could ever interpret another human being as an actress. I clearly recall spending a significant time thinking of characters being worked on in theater class and becoming emotionally upset that I never left time to explore what I liked to do. It just felt unfair to both me and the authors of these characters. Subsequently, I eventually stopped acting and started devoting more time to studying yoga. However, I still had a few more years of self neglect and crazy adventures before I seriously committed to learning authentic yoga. In 2009, I became very ill. It was a blessing, because I would not have been strong enough to leave the fun, easy, unhealthy life I had nor the emotionally challenging partner I was with at that time. The disease took me back home to my parents in Italy for 6 months. I was heavily medicated and hospitalized. My wish through all this time was to go back to NYC and pick up yoga again but I just wasn’t strong enough to take responsability of my life, and leave behind the people around me that kept me stuck in bad and old samskaras. While in Italy and on the medications I was on, I had to drastically change my lifestyle. I was stranded in the house during this period and was only allowed to teach English to kindergarten kids in the morning for 2 hours. And, that’s where I refound yoga. I found that moving and interpreting words was the best way for them to relate to me. I adapted sun salutations and had them interpret animals through poses-I had never done this, and kept the teaching fluid as I went. This experience was the most nourishing and fulfilling thing I had ever done in my life! The kids loved me, and trusted me. They went home and their parents would tell me all they would do is talk about and demonstrate their yoga for their family. It was so sweet! They gave me so much strength and willingness to keep going. In this time I also found a Hatha yoga teacher. I hated hatha yoga, but I dragged myself to class, just to keep my body active, and my mind off the heartbreak, and physical pain. I hated sitting for 5 minutes through each pose, I was angry and I’m sure fellow practitioners could tell. The teacher was a very intelligent woman. She watched me from a distance and let me experience my own drama, challenging me in new ways. We had to do homework and we had quizzes in the class with the names of the asanas, and the benefits. It was a challenge, and I love challenges. This still practice really changed me. I was able to see the pain from a distance. I was also able to successfully go through the detox and I was learning to finally relate to my body in a whole new way. I also learned about a different way of feeding my body. My teacher was also an ayurvedic doctor and she helped me approach food in a new way. At 24, and half a year after my arrival, I convinced the doctors to allow me to return home, and to come back every six weeks for check ups and to pick up my meds to take with me. I applied and received a visa for a Shiatsu school (yoga does not get you a visa permit). I returned home, went back to Yoga to the People studio, and asked them If I could teach. They happened to have one more spot in their first training. I joined and 200 hrs later...as my Guru, Sharath Jois, loves to make jokes about :), I received a Yoga Alliance certificate and began teaching 6 hours a day, 7 days a week, at the different Yoga to the People studios. I thought I was set for life with the perfect setup, but the universe always wants to make sure you get to where you are meant to be. I was faced with challenging situations which had me leave the studio and finding my way to The Shala Yoga House. I have been here for the past 4 years. She insisted that I try 3 practices a week for a month. Again, I was presented a challenge and I accepted it. I took a sheet with all the postures home, memorized it, came back the next day at 7am with the entire primary series memorized (I had no idea it was the entire first series!). I “performed it” while looking at the sheet. After practice, Barbara came up and said “You know, you are meant to learn this over time memorized rather than look at the sheet. Why don’t we start from scratch tomorrow?”-I didn’t like that! So I tried Kristin the next day. She said the same thing- I didn’t like that, either! I went home and practiced it until I had it down. I then returned following week with no cheat sheet. I’m certain more than anything, they were just amused by my fiery intention to have it my way. After a month I was intrigued by my experiences from the practice. I began noticing changes in the way I was approaching situations and recognized that I was constantly talking about my practice and day-dreaming about the next time I would practice. Interestingly, I noticed that a typical vinyasa class began bothering me. I craved the quiet space in the Mysore room. The shala did a training during this period which I attended, and some amazing teachers came including Lady Ruth, Christopher Hildebrand, John Campbell, Tim Miller, Ron Rein and Marla, Maria Rubinate, Lisa Swemp... all of these wonderful beings talked about the lineage and Guruji and this wonderful practice. They broke it down...and I fell so in love with it! I was obsessed, i wanted to experience what they had shared and visit the Source. I wanted to learn everything and I wanted it NOW! I booked my flight to Mysore, registered and brought my “husband to be”, with me on this journey. We learned so much! I would like to point out that my journey is one of finding self acceptance, of seeing opportunities for education in situations I may find uninteresting. Yoga has taught me to relate and appreciate my body, food, and life. I teach people the same using asana and nutrition. Asana is the tool through which I get people to experience their bodies in a unique way and to also empower themselves. It took me a long time to see my body as a vehicle for my soul. And I always loved and appreciated my soul. I just thought my body was getting in the way of it. I'm here to share what the universe has shown me through my life experience this far. I believe in getting on the mat every day with devotion because it’s only with devotion and commitment that we can take responsibility of our actions. It is only with continuity though the good and bad days that we can really break through old patterns and recognize that the work we do transcends the physical. The asana is only one part of it, but it is only by going through the fire of asana for a long, uninterrupted, period of time that we can come to understand everything that follows. That is why I love this practice, it makes me a better person. I am so blessed to have such amazing teachers. Watching Sharath teaching and seeing his devotion, seeing how he meets all of us where we are with acceptance and love, yet with enough clarity and detachment that he can push us up against our limits for a good cause. Speaking of Sharath, you had the honor of assisting him during your recent Mysore trip. Can you share your thoughts on that experience? Assisting Sharath has been such a huge blessing. I feel his presence in the room with me; he is such a gentle teacher. I went into the experience nervous and a little scared. Sharath authorized me before I began assisting which I felt gave me permission to feel supported by him; as if I had his trust, and that grounded me. Being in the room with him is the most wonderful experience. The energy of the room, watching so many bodies moving, all in different forms. The trust that not only Sharath, but the people place in your hands is very humbling. Most importantly, I learned about devotion! He shared that he slept two to three hours almost everyday, but he showed up and was attentive to every single being in that room and to all of his assistants, with so much love. That is the biggest takeaway for me; the strong belief this man has in the practice and how willing he is to put all his love and patience into teaching us properly - both the students and the teachers. Before I assisted, he cleaned up my whole practice. Every asana was picked apart and he reminded me about little things I had let slip. I realized that Ashtanga is not about making the perfect pose; some bodies will never be able to, it’s more about breaking through the limitations of the mind, it’s about properly positioning the body in the asana so the prana can move properly, then cleaning happens. It was just magic! I am so grateful! I am young. I am new to this compared to others who have been on the path for 10-25 years. So many well known teachers have practiced 20 + years. I haven’t. But the four years I have spent on the mat with this specific practice have been intense, and guided by the right people. I have grown 10 lifetimes since I committed. I share the little I know with the hope it may inspire people of all ages to commit to their truths, and I see it happen everyday. I feel so lucky and blessed to watch this process unfold. I am beyond honored to hold the space for people to come in and find that for themselves through this practice. I have Sharath’s blessing to do that and it is my duty to give share everything I can. Every morning, I show up and I share the love I have been passed down for this transformative practice. A big part of the practice has been making peace with myself; learning to eat in the correct manner...to extend the practice on my plate. Making the right choices to support a body that hold a fierce, peaceful, honest, and willing soul. You touched on the Mysore practicing room completely changing you, the quietness of the room and how it affected your ability to practice other styles that were led by a teacher (vinyasa flow, et cetera). What do you think it is about that quietness of the practice that draws practitioners back? It’s a paradox, you can’t escape your mind but you can transcend it is by using the tools we are given: gazing point- or placing your eyes in one spot, asana- or the posture and locking the attention of the body in that way, breathing - ujayi breathing is deep breathing with sound- the sound helps us to stay present to it. If you don’t want to hear your mind, you’ve got no choice other then applying these techniques. It may take a while and it can seem a little annoying to look at your nose or at your fingers, and your mind may find things to say about them too, but then you bring it back to the breath. In the end, everything that we think is a limitation - like the mind stuff, the stiffness…are actually guideposts to assist us in learning to use the practice properly. This practice is so smart, there is no tricking it! Injury often comes as a teacher too, when you practice mindlessly the body will get injured. When you practice for selfish reasons, sickness will show up in your body. The quiet space gives you a chance to get to know the kind of mind you have and train it to stay on task. We are accustomed to blaming exterior things for our sufferings and discomforts; Ashtanga teaches to be responsible of who we are. This practice tends to attract type A people. You mentioned how you came into the practice a bit overconfident. Did you notice an inflection point where you recognized the practice taming the ego? I certainly did! and still do :) That mainly came with getting to know my teachers, and speaking to them. I realize now looking back how patient they were with me. They guided me gently to veer away from it. Because of my competitive sports background in gymnastics, sailing, and skiing, I was brought up to “perform” to win, to be the best in order to be recognized. With Kristin and Barbara, I learned that there was no one to impress. I admit that I tried to impress them both many times at the beginning of my journey, but they would never show any sign of being touched by it. So, I stopped trying. I became more quiet inside, I stopped feeling the urge to stand out. Now, I feel the practice is my private space to be quiet and go within. It’s a time to be intimate with myself and God- not religious, God, but, Higher Consciousness God. My practice is now my prayer to the universe. It wasn’t this way until I felt safe enough in the practice, where I felt I could ease, where I could feel I did not want attention. That is why practicing consistently is so important because all these changes have to happen from within. It’s a silent inner transformation that unfolds only if you allow it to by showing up. You have a lovely website clearly devoted to helping people live a clean lifestyle with yoga and healthy foods. What inspired you into this area and how integral is nutrition to the practice? My own journey inspired me. My biggest struggle has always been establishing a healthy relationship with my body and with food. Ashtanga taught me about what it feels like to be hungry, it taught me to listen to my body’s needs, and it taught me to eat without fear. As these lessons came up, I felt the need to educate myself. I signed up for a year-course at Integrative Nutrition where I dove headfirst into nutrition, food, lifestyle and cooking. When I graduated, I started working with clients as a Holistic Health Coach, helping them learn to lead healthier lives by making small changes, just like in Ashtanga- one consistent and committed step at a time. My clients stories really helped me heal, too. The practice always informed the way I approached my diet - vegetarian, seasonal as much as possible, and environment friendly. The practice of eating and that of asana are very similar, both are structured, so once you have a structure you can relax into it. I guess practice inspired me to learn to feed myself, to appreciate myself. I try my best to provide recipes and inspirations for free in my weekly newsletter, and I offer programs for people who feel they need a bit more guidance. Depending on the choices I made the previous day my body would feel different, which led me to over the years learn to eat and nourish my body - reason why today I teach it. Personally, for me and nutrition, the main choice affecting the practice and the way I felt during it was correlated with food; I realized that the timing of my meals the previous nights greatly impacted the practice - if too late 1) Makes my body feel sluggish and lethargic 2) Binding became difficult. Can you share your thoughts about your past teachers? Bibi, you made a very interesting point: “You can’t escape your mind” (response 3) and the remedy is utilizing tristhana during practice to quiet it. How can a student best apply what we learn on the mat to life? When on the mat, you have the chance to understand how your mind reacts. You become familiar with the space between breaths and with being in control or having the ability and choice to bring the mind back to the tip of your nose, or the sound of your breath. You see it happen time after time. The drishti actually makes your mind strong and clear. The actual practice helps to clean out all the dust from within you. That is what primary is about, it thoroughly cleanses your physical body, every organ is cleansed so that sickness can be eradicated from your body and then your mind can settle with practice. As your body starts to cleanse your cravings start changing. Your diet automatically becomes more clean. With the body clean, properly functioning with a proper free flow of energy, and a clean diet, the mind will be sharper. There is less fogginess, less noise. Your perception changes. We consciously choose to retrain our reactions. We unlearn. My theater teacher, John Strasberg, said, “To learn to act, you must discover or uncover what's blocking your truth.” This is the same. Every time we react, it’s a new opportunity to learn to put the practice in life. Can you breathe? Can you put your attention in one place or take it away from a stressful place and move it to where it will help you see the open space? The end goal is unity in all we do, and to have unity, we must be able to embrace what we have right here and right now: Vitarka vicarananda smitarupa nugamat sampragnatah. Then, the object is gradually understood in its totality. At first, this understanding is at a more superficial level. In time, comprehension becomes deeper. And finally, it is total. There is pure joy in reaching such a depth of understanding. At which point, the individual is so much in unity with the object, that he is oblivious of his surroundings. Can you share with us how Mother India has impacted you? Visiting Mysore is like going back in time. It's taught me that you can’t have a plan. Every time I go back, I'm reminded that I shouldn’t focus on making excessive plans, but rather focus on being ready to adapt and stay open. Nothing goes as planned in India. It teaches you to stay flexible in your mind. I had a lot of anger come up on my first 2 trips. It was very cleansing for me. Everything made me angry, buses that were never on time, people that say 5 minutes when really it could be 5 hours, electricity leaving when you most need it, being stared at, paying more because you are a tourist...its hard to remember the negative, irritating things when you are not there because all that stays is the positive. But, India has definitely taught me to soften, to let go, and to trust. Things in india always somehow magically work out, in their own time and form. I'm always left bewildered by how much magic surrounds this country and its population. In no other country would buses be allowed with driving so fast with doors open and filled with people; no cows could walk in the middle of the street and not be run over...but there there is this higher energy that protects it all. Of course tragedies happen, they are meant to, but the presence of God is so strong it really makes it all magic. And, it envelops you. You want to pray, you want to bow down. They bless all their objects, activities, foods, animals! They have a festival that lasts 10 days and each day is to give thanks to and bless a specific object or vehicle that is part of their life. So there is a day for tools, a day for technology, a day for vehicles, a day for pets. These are “dressed up” with flower ornaments and taken to the temple for puja..its insane, yet if you let go and be part of it its so beautiful! I think that holiday really describes my idea of India. A magical-kind-of-like-Roal Dahl's, “Matilda” style. It teaches you to either be free or be really frustrated that you aren’t, which is generally how i feel :) You forced to face all of your attachments! I like to go and try to live like them. Do my laundry by hand, bucket bath, oil baths, go to the market daily and cook my food and attend temple. I usually don’t get a phone which allows me to experience what it’s like to just Be. What does Guruji’s “99 percent theory, 1 percent practice” mean to you? You must go through the fire of asana practice to understand any other part of yoga. The first thing a student should earn is to be consistent with practice, out of consistency, devotion will arise if guided properly, and then curiosity for more. But, if you don't get on the mat daily no magic will happen. No matter where you are in the journey- a beginner, advanced, senior- you must always devote time for your practice, whatever form that may take as you move through the different stages of life. This is my point of view on it, maybe in a few years i'll have a different answer, but this is what I am transmitted from Sharath-no excuse, you get on your mat and you do your practice. Laziness is the only reason why one can’t do asana practice. What is your advice to self-practitioners who aren’t in a position to visit a shala daily? Find ways to motivate yourself; get your friends, siblings involved. Talk about the way practice makes you feel. Be exited, be angry, be curious, be disinterested but make the commitment to show up. There are many sites, videos, online communities now as the Ashtanga method spreads - find a way to be in touch with other practitioners around the world. Read blogs about the practice, watch videos. And most importantly, try to make at least a monthly or bimonthly trip to a shala if possible so that someone can monitor your progress. And, make sure you are doing things properly. That will also ensure your fire is kept alive. Go to Mysore!